Catherine Margaret Bruce was born and raised in Winnipeg, Manitoba on November 25, 1917, alongside three younger brothers. Her long career at the Winnipeg School Board spanned an extensive 40 years, where she worked primarily as a bookkeeper. She was very active in the church and belonged to their choir, and was involved in her community with groups such as the Eastern Star and the Women’s Institute, among others. Catherine’s friends knew that her kindness was unmatched and appreciated her loyalty and her great sense of humor. She was a lover of animals and cherished her pets deeply. One of her favorites was Missie, a Yorkshire Terrier, with whom she was best friends with for 15 years. Upon her retirement, Catherine relocated to Kelowna to be close to her brother and sister-in-law. There, she continued being active both in the church and community. Catherine passed away on March 17, 2016 at the age of 98. 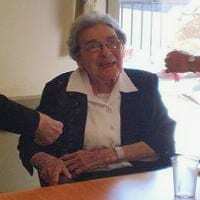 She was never married but will be lovingly remembered by her surviving sister-in-law, nieces and nephews, and friends.